Snake removal in Virginia is a common problem, the mere mention of the word snake evokes an emotional response. Misconceptions about snakes have made them among the most persecuted of all animals. In Virginia a common reaction to a snake is to kill it whether or not it poses a danger. The fact is that most snakes in Virginia are harmless and even dangerous ones would rather flee than fight. Snakes can be one of the most beneficial animals in Virginia. They help us reduce the rodent population. However, snakes pose a huge problem to homeowners and wildlife control professionals. Snakes are very shy and inhabit inaccessible places that are hard to see. Most of our customers have snakes in their homes and never realize it. One thing that 95% of our snake calls have in common is that most of the time there is a rodent or bug problem in the home. A key thing to do when dealing with a snake in your home is to find out what it’s doing there, what the food source is, and what stage of growth it’s in. These are three key factors in helping us determine a program to eliminate your snake problem. Very rarely will removing a snake from your home completely solve the problem. Virginia is home to 30 species of naturally occurring snakes. Of these, only three species are classified as being venomous. They are the Copperhead, Timber rattlesnake and the Cottonmouth. In urban settings, a snake in your home is one of the most difficult nuisance situations for homeowners. As mentioned earlier, a snake is typically in your house to find food sources such as mice and rats. Eliminating the food source will likely solve your snake problem. In Virginia almost all snake species that enter homes are non-venomous. Snakes can enter through the same openings used by mice and rats. A good way to prevent snakes from entering your home is by sealing all crevices and spaces where pipes and electrical wires enter the dwelling. This is a very time consuming task and requires a wildlife professional to inspect the property to assure you don’t “seal” the snake inside your home. Inspections involve checking a prescribed area for the presence of snakes. One of the most important aspects of this service involve the identification of key snake habitat and entry points. Some of the more common problems Weaver’s Wildlife Control sees with snakes in an urban environment is snakes in garages, snakes under houses, snakes in attics, and snakes in abandoned woodpiles. If you find a snake and you do not know whether or not it is venomous, the safest thing to do is leave it alone and call Weaver’s Wildlife Control immediately. 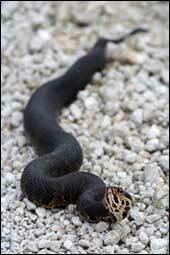 Weaver’s Wildlife Control is ecologically responsible, ensuring that only environmentally sound solutions and humane removal techniques are used for all snake removal situations. We provide all forms of snake removal, control and management in the Hampton Roads and surrounding area for residential, commercial, state and federal properties. Every snake situation is different, so we offer many snake removal and control services.